Home > Where can you get Aloe Vera? Where can you get Aloe Vera? Where can you get an Aloe Vera Plant? It's perfectly possible, in some areas of the world, to find Aloe growing freely in the wild. In other regions the plant can be purchased from many nurseries or garden centers. We cover both options below. Where can you get an Aloe Vera Plant in the wild? If you are looking to get a plant that grows in the wild that you will probably find it with some ease in the Mediterranean, Africa, Caribbean, Australia, the southern states of the USA or some of the northern countries of South America including Mexico. In other words anywhere with a hot climate that remains above zero year round. The difficulty is in getting the right Aloe Vera. There are over 300 types and only a qualified person or locals who use it regularly will be able to tell you the difference between one that will do you the world of good and one that will never be more than pretty in the garden. Where can you buy an Aloe Vera Plant? With a growing awareness about the benefits of Aloe Vera that many people claim to experience it is little wonder that many garden centres are now stocking Aloe Vera pot plants. Ideally Aloe Vera needs warm and windy conditions which strengthen the leaves. Without the wind they flop, as can be seen here. Even the popular small window sill type offerings can provide enough fluid to heal the odd cut, graze or burn by breaking off the end of a leaf and squeezing out some of the inner gel. However the smaller plants are immature which means their potency is limited and so therefore are the benefits. By definition their size makes them too small anyway to provide enough gel for creating drinks. Not quite so freely available are full size Aloe plants (a mature Aloe plant grows to about 5 feet (1.5 metres) tall) which you could consider for the garden if you live in a frost free climate. This will give you a source for harvesting the occassional leaf which would be a reliable supply of gel if you are making your own body creams or lotions but you would need several plants if you also wanted to make regular drinks. We have not mentioned conservatories because ideally Aloe grows best in windy conditions. Without this the leaves 'flop'. Note many stockists of Aloe Vera plants don't understand it at all and only have it on their shelves because of the buzz and for the profit. But it means a great many plants that pass through the checkouts every year are not the variety (Aloe Barbadensis Miller) that provide any benefits. As mentioned above there are over 300 varieties of Aloe Vera but most retailers simply label it as 'Aloe Vera' and do not themselves know any better. It's a good seller, what else do they need to know? You can get Aloe Vera plants in the wild and in many nurseries and garden centres. But confusion, ignorance or misleading labelling means getting a variety that will provide you with benefits beyond being ornamental can be very difficult. It is also one of the reasons many people try Aloe Vera with such wildly differing results. 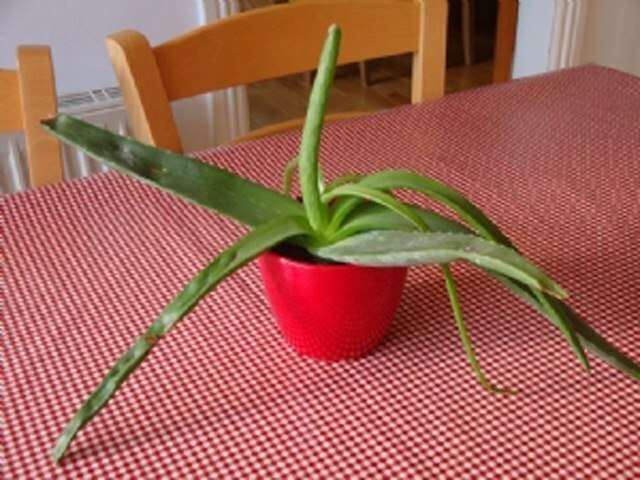 Person A gets an 'Aloe Vera' plant and finds it really helps them, person B gets an 'Aloe Vera' plant and sees no benefits at all - neither realise they actually have different varieties. Where can you get Aloe Vera leaves? This picture gives some idea of how large a mature Aloe Vera leaf is and the color the inner gel should be. Because raw Aloe Vera Gel that has not been tampered with (freeze dried, made into a concentrate, watered down) is the most potent there has been a growing demand from consumers to get whole leaves. But As the labelling of drinks and lotions is poorly regulated - manufacturers can claim their product is "100% Aloe Vera" when it only contains 15% - getting the whole leaf would seem like a clever way to bypass these risks. Aloe Vera leaves are also large enough (up to a meter long) that they can be used to make drinkable juices or mixed with other ingredients to produce body creams and lotions. Remember: Only use the inner gel and discard the outer leaf which, if taken internally, will cause digestion problems rather than solve them as it contains toxins. Where can you get Aloe Vera leaves in the wild? The same advice for getting Aloe Vera plants in the wild (see above) follows here in terms of locations where you are likely to find it and in terms of making sure you are actually take leaves from an Aloe Barbadensis Miller variety, not one of the other 300 or so varieties which could do anything from nothing at all to giving you severe indigestion. The leaves to take are those from round the edges and on a plant three to five years old. Immature plants have not yet built up an inner gel worth using on anything more than the odd small cut, graze or burn. The leaves should be broken off as close to the base as possible but even with the best care some of the gel will become exposed to the open air and the natural process of oxidation will begin so. Just like an cut apple, the goodness will be disappearing hour by hour. In other words these are not items that can be taken home from a holiday or stored for long and still hold any goodness. Where can you buy Aloe Vera leaves? As demand for purchasing whole leaves has grown many farmers have stepped in to fill the gap. They either supply freshly picked leaves straight to local grocery stores or limit the oxidisation process by vacuum wrapping the leaf so it can be shipped. 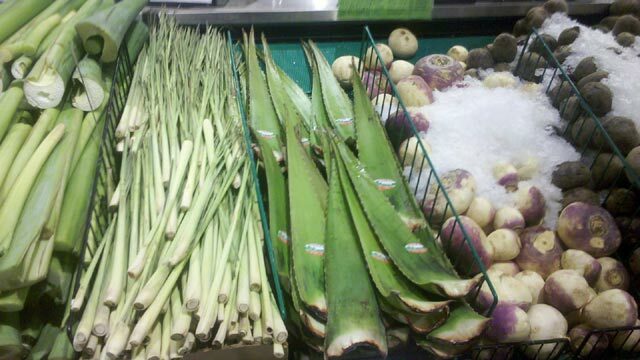 Aloe Vera leaves are sold alongside other fruit and veg in many shops. Note the black edges at the bottoms of the leaves where they have started to oxidise. Unfortunately, although there are many good suppliers, there are also the usual cowboys at work. They are mostly guilty of supplying the wrong type of Aloe Vera (sometimes through there own ignorance) or harvesting before the plant is mature in a haste for profit. Aloe Vera is not an annual crop - it takes 3-5 years to grow from a pup to a harvest-able item. If you are looking for the whole leaf then start with your local grocery store if you live in a climate with warm winters and hot dry summers (these are listed at the top of the page). Many shops supplying fruit and vegetables do not even realise their wholesalers stock fresh leaves until they ask! Should this route not work then search the internet for whole leaf suppliers in your area. Remember you are looking for Aloe Barbadensis Miller and leaves from a mature plant so ask the questions before you buy. This occasionally trips up the farmer who has never been asked before and is only in the game for the cash but ultimately it is difficult to prove from a single leaf if it is the correct variety and if it is mature - apart from the obvious size (19-40 inches or 50-100cm). Where can you get Aloe Vera Gel? Gel is the inner part of the Aloe leaf that contains all the goodness. If you can get hold of the leaf (see above) then its simply a case of pealing it and scooping out the gel. The video on our page How to use Aloe Vera shows someone doing just this. There are then issues regarding the need to purchase regularly in order to have freshness and time to process each leaf. Where can I get fresh Aloe Vera Gel? 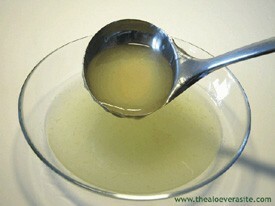 How a quality Aloe Vera Gel or Juice should look. Note the color and 'bits'. 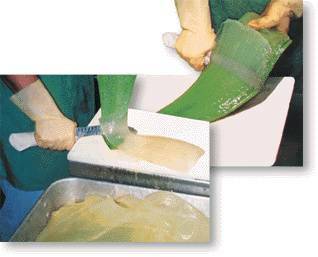 As it's possible to simply squeeze out the gel of a leaf (a mature leaf from the correct variety of Aloe Vera) it is possible to simply bottle it and sell. But like fresh squeezed orange juice it has a very limited life span and must be kept refrigerated at all times. This means it is usually only available in regions where Aloe Vera grows. These regions are mentioned at the top of this page and if you live in one you should ask your local food store if they can get fresh bottled gel from their wholesaler. Many can and are simply unaware of the fact. Again, as always, bear in mind labelling of Aloe Vera drinks is not regulated and there is nothing to stop the manufacturer watering down the gel and still claiming it is pure. Have a look at our page Pictures of Aloe Vera to see an example of what fresh gel should look like or see the video on the page How to use Aloe Vera to give you a good idea what you are looking for. Where can I get stabilised Aloe Vera Gel? If it's not possible to get a good quality fresh Aloe Vera Gel in your area then the alternative is gel that has been through some sort of stabilisation process in order to give it a longer shelf life. To correct a point of confusion here gel still relates to a drinkable product as well as one that can be used on the skin. The good news is that it is possible to identify quality drinkable gels but it is very much a case of 'buyer beware'. Watch the video 'Good Quality Aloe Vera Part 1' on our Good Quality Aloe Vera page to find out how. Much of the content is also included in the text of the same page. If you are looking to buy Aloe Vera Gel we list sources for some of the major brands on our page Where to buy Aloe Vera. Where can I get Aloe Vera Juice? There is often confusion here between Juices and Gels. Both are drinkable and both could be used on the skin to help with a variety of issues from sunburn, cuts and grazes to more serious ailments such as eczema and psoriasis. As a very general rule of thumb gels contain more aloe than juices. This does not mean juices will not benefit you, just that they will benefit you less. However where the gel has been mixed with some other natural product, such as cranberry juice, the mix may be more beneficial anyway for certain purposes. It is only when the Aloe has been watered down that the benefit starts to get truly, and literally, diluted. However this general rule of thumb is a very blurred line. As there are few regulations governing the labelling of Aloe Vera products many suppliers call their juices gel. Others believe consumers will not believe a gel can be drunk and so call it a juice! So what to do? Rather than rely solely on the labelling we recommend a set of steps that will identify good quality drinking gel. Videos showing how to do this can be found on our page Good Quality Aloe Vera. If you are looking to buy Aloe Vera Juice we list sources for some of the major brands on our page Where to buy Aloe Vera.